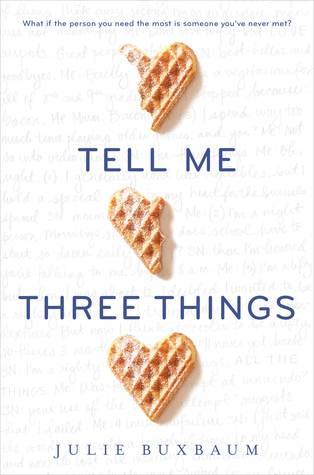 When i first got the book tell me three things i thought it was gonna be a relatable book cause it’s about a girl who is a junior and talks to someone online which seems pretty similar to today. Then I started reading more of it and it wasn’t quite what i expected. It’s more about this girl being herself and trusting one person to guide her through high school. Which is pretty common in other stories and movies. I still think it’s different and good though, because it’s really important to have that one friend that helps you get through high school and that’s kind of what she’s trying to let happen but she’s having trust issues at first which actually can be relatable. Even in our school gossip can get around and you need that one person that you rely on and now that you can trust them and get help from at bad times. I can already predict that something is going to happen between her and the anonymous person that is trying to help her and be her friend that will make him show his true self and she is going to have to learn to forgive him, the anonymous person might even be someone she has a crush on in real life. However this book would definitely take a turn being that it’s not the predictable book i thought it is going to be i feel that it has a good amount of mystery. Although i haven’t read to much of it yet so far though i really like how the book is set up in the way the main character is telling it. On some of the pages it’s her sending back and forth emails with the anonymous person and the interesting conversations they have with a little bit of humor here and there. It makes the book a lot more interesting and adds foreshadowing on different events that may or may not happen at her new high school. The book has an overall good mix of comedy and the tragedies of life and high school.